21 After consulting the people, Jehoshaphat appointed men to sing to the LORD and to praise him for the splendor of his holiness as they went out at the head of the army, saying: "Give thanks to the LORD, for his love endures forever." 22 As they began to sing and praise, the LORD set ambushes against the men of Ammon and Moab and Mount Seir who were invading Judah, and they were defeated. "Jehoshaphat appointed men to sing to the LORD..."–I took a quick survey in all three of my choirs yesterday to see if their congregations had any controversy with either women being choir directors or women being in their church choirs. I even asked if their was any talk that women shouldn't organists in their churches. Thankfully, it seems this misapplication of scripture has died down, at least in our area, or my students are oblivious to it. "...to sing...as they went out at the head of the army"–this reminded me of what Henry V told his army to do after they defeated the French in the Battle of Agincourt (1415) during the Hundred Years' War. Henry V, according to William Shakespeare, told his troops to sing "Non nobis" (Not to us--Ps. 115) and "Te Deum" (To you, O God) after they routed the French, having been outnumbered 10 to 1. Whoa! A new instrument! Up until this point, singing in the temple has been accompanied by harps, lyres, and cymbals. Now, the trumpet is introduced into worship, and not just as an accompaniment instrument, but in unison with the singers, as with one voice (hmm…the title of Augsburg Fortress's hymnal supplement, With One Voice). Don’t picture a modern orchestral trumpet. Picture a shofar, a ram’s horn. No valves, no yards of tubing, just a hollowed out ram’s horn. If you have ever tried to play a modern trumpet (or any brass instrument for that matter) without using any valves, just using the buzzing of your lips and the tightening of your embouchure to play the scale, then you know that either you have to be a really good trumpeter to play a scale without valves, or you won’t be playing many notes—you’ll just sound like a person at a parade or ball game with a plastic trumpet just making a lot of noise. It really makes you wonder what the melody of the singing was like if it was accompanied by a ram’s horn that had no valves and couldn’t play many notes of the harmonic overtone series. And was God pleased or what!?! His glory filled the temple, just like He led the Children of Israel with the pillar of cloud through the exodus and wandering in the wilderness. Isaiah talks about the same cloud filling the temple and Martin Luther penned this picture into his hymn Isaiah, Mighty Seer, in Days of Old. So what is the singing application for us? 1. Praise God with instruments and singing together (believe it or not, in the desk of my first teacher’s desk, was a pamphlet explaining why instruments should NOT be used in worship!). Strong's H7782 "trumpet" vs. H2689 "trumpets"
A word needs to be said about the use of the word "LORD". I'll admit it. I frequently forget why this name for God is printed in all capital letters. I usually think in my mind "God" when I read "LORD", but then I miss the special nuance of this name of God. "In regard to the divine name YHWH, commonly referred to as the Tetragrammaton, the translators adopted the device used in most English versions of rendering that name as "LORD" in capital letters to distinguish it from Adonai, another Hebrew word rendered "Lord," for which small letters are used." "The Hebrew for this name is Yahweh (often incorrectly spelled "Jehovah"; see note on Dt 28:58). It means "He is" or "He will be" and is the third-person form of the verb translated "I will be" in v. 12 and "I AM" in v. 14. When God speaks of himself he says, "I AM," and when we speak of him we say, "He is." Just think this when you read "LORD": this is the name for God who promised to send a savior for all the world. For a listing of every reference to the name "YHWH" in the Bible, click here. There are two strange things in this passage, at least strange on first glance. Trees don't sing! So why they are singing? Why are trees described as singing? Everything that God created praises him. Can you make a tree? No. Can you create anything that has not already been created? No. If you can't do it, but God did do it, then just looking at the trees reminds us to praise God for his wonderful creation. Why are the trees singing if the LORD (the God of the promise) is coming to judge the earth? Why aren't they terrified? But isn't this really what we all wait for--the end of sorrow and death and pain? Don't we all want to be in perfection and not have to deal with the "drama" of this life? Even the trees are waiting to be released from their groaning. So what about us? God created us--we should sing to him and praise his name just like the trees and all creation does. Does the thought of the Creator coming to judge the earth scare you? It scares me. I don't want everyone to know all the sins I've committed. And I surely don't want to go to hell and be separated from God for all eternity. Does it get any more clear than this? God's blessings are everywhere. It's just nice to keep getting good news from around our synod. This morning I got an email from my college classmate, Joel Ungemach, who is the choir director at Manitowoc Lutheran High School in Manitowoc, WI. He sent me a link to the local newspaper's front page story on the plans for MLHS's new music center. Read the story and help me rejoice in God's blessings on Manitowoc Lutheran's music program! What should we sing to him? Praise! What are God's wonderful acts? He created all things out of nothing by speaking. Even though we rebelled against him, he has a plan of salvation for all people. He allowed his son, Jesus (God's son), to become like us (Mary's son) so that he could perfectly live our life and perfectly die our death. 27 Now David was clothed in a robe of fine linen, as were all the Levites who were carrying the ark, and as were the singers, and Kenaniah, who was in charge of the singing of the choirs. David also wore a linen ephod. The ephod was a sleeveless vestment worn by the high priest. In this verse, King David, who is not the high priest, nor was he a Levite, was wearing the ephod and a robe of fine linen. The Levites and the choir director were also clothed in linen robes. What does all this signify? The choir director (Kenaniah) was also a religious leader, clothed like a priest, because he was also leading worship since he was in charge of the singing of the choirs. Prepare for goosebumps! Click here for a video of the Arizona Lutheran Academy choir singing the National Anthem at the AZ Diamondbacks Baseball Game on Sept. 7th. The choir is directed by a good friend of mine, Jon Pasbrig. Outstanding job! You will be redirected to Motionbox and will need Adobe's Flash Player to view the video. 16 David told the leaders of the Levites to appoint their brothers as singers to sing joyful songs, accompanied by musical instruments: lyres, harps and cymbals. This just makes sense to me. My brother is a pastor. I am a church musician. That's how it was in this passage too. The Levites were the priests in the temple and their brothers were the church musicians. The only difference between this setup and my family is my brother didn't appoint me to be a musician, God prepared me to be a church musician through a lot of encourgement by my parents. 19 The musicians Heman, Asaph and Ethan were to sound the bronze cymbals; 20 Zechariah, Aziel, Shemiramoth, Jehiel, Unni, Eliab, Maaseiah and Benaiah were to play the lyres according to alamoth , 21 and Mattithiah, Eliphelehu, Mikneiah, Obed-Edom, Jeiel and Azaziah were to play the harps, directing according to sheminith . 22 Kenaniah the head Levite was in charge of the singing; that was his responsibility because he was skillful at it. Wouldn't you just like to hear what that sounded like? Crashing cymbals, strumming harps and lyres, and skillful singers. It's not exactly a pipe organ, a piano, the trumpets of Easter, or even a praise band. But it's the music that God wanted in his temple. There's just one phrase which keeps popping out at me in this passage: "because he was skillful at it." God gives talents to all of us, even musical talents. But it's up to us to use those talents for his glory. If God gave you five talents of singing ability and you chose not to use those talents, you'd be in danger of those talents being squandered just like what happened in the Parable of the Talents. But if God gave you two talents of musical ability and you used them faithfully, He promises to give you even more. What does that have to do with the phrase "because he was skillful at it"? We need to cultivate and encourage the musical gifts that God has given to his children. We should not expect those musical talents to grow by themselves. We need to teach children how to sing and play instruments at every age and grade level so that it can be said of those same children that they are "skillful" at it. And then the music of worship will be as close to the music of heaven as we can approach on this earth. If you click on the middle of the video, you will be taken to YouTube. If you click on the play button in the lower left corner, you will play the video in this window. But if, baby, I'm the bottom you're the top! Your words poetic are not pathetic. As the French would say, "de trop". You're a dance in Bali. I'm the nominee of the G.O.P. There are so many reasons why I am proud of my kids, but chief among them is singing in front of large crowds without any accompaniment. You could add to that practicing really hard, composing their own alto line, and taking time out of their school day to sing for me many times and get my advice. I am very proud of Britt and Alyssa. Way to go, girls! This performance was for the WLA vs. Mayville varsity football game, September 14, 2007. UPDATE (9/18): CNN reports searches for Steve Fossett scaled back. Every Saturday morning I like to listen to the Kim Komando radio show on KFIZ 1450 AM, Fond du Lac, WI. Even though I am a Mac addict, I like to hear what is going on in the digital world on the PC side (I know, the "dark side"!) and frequently pick up tips that I never knew. Today, I got an email from the Kim Komando show (copied below) which listed their cool site of the day, but this is more urgent than cool. Kim's Cool Site of the Day is Amazon's Mechanical Turk. I had never heard of it before, but quickly realized its importance in helping find this veteran aviation adventurer. If you have the time and the ability, you might help either save his life, or help his family find him and his plane wreckage. If you read the news, you know about the search for Steve Fossett. The adventurer and his aircraft disappeared about two weeks ago. Fossett did not file a flight plan. So rescuers are unsure where to look for him. But he is believed to be in southwestern Nevada. Fossett’s friends and family are asking for your help. No, they don’t need you to fly to Nevada for a ground search. Rather, they’re asking that you help review satellite images. Google has gathered recent images. Hopefully, Fossett’s plane will appear in one. To get involved, visit Amazon’s Mechanical Turk site. It will present you with images to review. If you see something, simply flag the image and leave a comment. You’ll need to register in order to help out. All three choirs will sing for their progress report grade next Monday and Tuesday. Students who have a practice time at school during blocks 1, 2, 5, or 8 may sing individually with me for their grade. All other students will have to sing during class on Monday, Sep. 17 and Tuesday, Sep. 18. Progress Report Day is Wednesday, Sep. 19. I will sing praises to your name. "The LORD lives! Praise be to my Rock! Exalted be God, the Rock, my Savior! 49 who sets me free from my enemies. from violent men you rescued me. God did all those things for David, that's why he praised Him. So what has God done for you? Has he avenged you? Has he freed you from your enemies? Has he exalted you above your foes? Has he rescued you from violent men? Maybe. Or maybe not. He did that for David. Has he given you health? Friends? Food? Clothes? A job? Children? A Family? Gifts? Abilities? Talents? Should I continue? Isn't it obvious? 35 I am now eighty years old. Can I tell the difference between what is good and what is not? Can your servant taste what he eats and drinks? Can I still hear the voices of men and women singers? Why should your servant be an added burden to my lord the king? How did he get there? Why is he asking these questions? and David his tens of thousands'?" David has been on the run. Saul, though still the king of Israel, was afraid of David and wanted him dead because he, Saul, knew that the LORD had left him and was now with David. And it didn't help that the women's song taunted him even more. The people of Israel could see that David was being lead by the LORD, but Saul didn't want to believe it. David, the boy who once had killed Goliath in the Valley of Elah and who helped sooth Saul's evil spirits by playing his harp, had also become good friends–lifelong, sworn friends–with Saul's son, Jonathan. Everything reminded Saul that the LORD was no longer with him. Saul tried to fight his own battle and get rid of David by throwing spears at him in the temple, but to no avail. But David knew the time had come to flee for his life. He went to Nob, a town NE of Jerusalem and S of Gibeah where the tabernacle was relocated after the destruction of Shiloh. While on the run, he needed food, and asked Ahimelech the priest for the showbread from the table in the tabernacle. He also needed a weapon, and Ahimelech gave him Goliath's sword, which David had once taken from Goliath after he killed him with his slingshot and used to cut off Goliath's own head. Did David ask the women to sing for him? No. Did David give himself the honor and glory for defeating Goliath? No. Did he look for the glory? No. But God let the women sing his glory and praises. God will do the same thing for us if we are humble. God humbles the proud, but gives grace to the lowly. 6 When the men were returning home after David had killed the Philistine, the women came out from all the towns of Israel to meet King Saul with singing and dancing, with joyful songs and with tambourines and lutes. In the previous chapter, David killed Goliath, the giant of the Philistine army. Little David–the boy who was left at home when his brothers went off to war. Little David–too small to wear the heavy armor of the Israelite army. Little David–braver than any other soldier in Israel. Little David–not the person that anyone (except the prophet Samuel) expected to amount to anything. Little David–who chose to go into battle with a rock and a slingshot rather than a sword. That little David killed the most fearsome fighter in the Philistine army. So in today's verse, when it says "after David had killed the Philistine", it's referring to Goliath. And you can understand why the women came out to sing and dance: no one else in all of Israel wanted to fight Goliath, nor thought that they could kill him. The entire army sat on their hands for 40 days while Goliath taunted them. Sometimes our enemies seem larger than life. Sometimes our battles seem hopelessly futile. We think we can't do anything to change the situation we are in. But we've got an improbable ally who fights for us–someone who most people wouldn't expect to fight our battles and win. It's God. The same God who helped David defeat Goliath fights for us. If God is for us, who can be against us? Paul Gerhardt wrote a hymn (TLH 528) on this same topic. 11 the voice of the singers at the watering places. the righteous acts of his warriors in Israel. went down to the city gates. "the voice of the singers at the watering places"–what did people do when they were getting water for their animals (i.e. hanging out and waiting around)? They sang! What did they sing about? We should sing about the righteous acts God has done through us. If all a hymn or song does is repeat "praise God" over and over and over again and never says what we should be praising Him for, we are not reciting the righteous acts of the LORD. We are not telling why God should be praised. We are, at best, a clanging gong or a crashing cymbal. If all a hymn or song does is to say how we feel about God but never points our attention and understanding back to God, then we are only praising ourselves. I'd love to hear your examples of hymns and songs which "recite the righteous acts of the LORD" and hymns and songs which tell of the righteous acts God has done through us. 3 "Hear this, you kings! Listen, you rulers! I will make music to the LORD, the God of Israel. The Children of Israel, led by Joshua, crossed the Jordan River into the Promised Land in 1406 BC. Led by the LORD, they drove out many great and powerful nations and were now, finally, at rest. After Joshua's death, however, the Children of Israel quickly seemed to forget to do everything God had commanded them, even though under Joshua, they were gung ho to follow God and Joshua. Tribe after tribe did not drive out the Canaanites completely, which angered the LORD so much that he sent the angel of the LORD to deliver the horrible news that He would not drive out the Canaanites for them anymore. They, the Canaanites, would be thorns in their sides and their gods would be a snare to the Children of Israel. A generation passed. And the next generation grew up not knowing the LORD or what He had done for Israel. All of Israel did evil in the eyes of the LORD and served the Baals. In His anger, God handed them over to raiders, let them be plundered, sold them to enemies, and made sure they were defeated. What an awful place it is to Have God working against you. In today's "sing" reading (Judges 5:3) the Children of Israel had fallen into the hands of Jabin, the King of Canaan, and the commander of his army, Sisera, who had 900 iron chariots. Deborah, a prophetess, was leading Israel at that time (1209-1169 BC). Deborah delivered this message to Barak (whose name means "thunderbolt" and who is named among the heroes of faith in Hebrews 11:32): "The LORD, the God of Israel, commands you: 'Go, take with you ten thousand men of Naphtali and Zebulun and lead the way to Mount Tabor. I will lure Sisera, the commander of Jabin's army, with his chariots and his troops to the Kishon River and give him into your hands.' " But Barak was a typical guy and said he would only do it if Deborah went with him. She reluctantly agreed, but she told him that the honor of the victory would be hers because of the way he was acting. God gave the Canaanite army into the hands of Barak. All the troups of Sisera fell by the sword. Not a man was left–except Sisera himself, who fled on foot to an ally's tent. There he asked to be hidden, which Jael, the wife of Heber the Kenite, was all too eager to do. She not only hid him in her tent, but let him fall asleep there as well. While he was sleeping, she drove a tent peg through his temple with a hammer. Jael found Barak and showed him that she had killed Sisera for him. It recites "the righteous acts of the LORD." Isn't that why God gave us the ability to sing? To praise him with our voices and to remember what He has done for us? 19 "Now write down for yourselves this song and teach it to the Israelites and have them sing it, so that it may be a witness for me against them. Can a song be as important as a person's life? God wanted Moses to teach the Children of Israel a song that would not be forgotten by their descendants (v. 21) to be a witnesss against them (v. 19) and testify against them (v. 21) when they do reject Him and break His covenant (v. 20) in the Promised Land. So what is this powerful song? The Song of Moses. Read Deuteronomy 32 and think of every Bible story that you have been taught about the Children of Israel in the Promised Land. They didn't follow God's commands. They did as they saw fit. They worshiped false gods. They intermarried with the heathen. They didn't do all–ALL–that God commanded them to do. And the Song of Moses bears witness against them because it is God's prediction of their falling away, even before it happened. Why don't we sing this song anymore? Why don't we read and teach God's Word from cover to cover, but instead pick and choose passages throughout the Bible, which are by themselves important, but, if only taken by themselves, lead to a confusion of the interconnectedness of God's story from beginning to end. Why do we sing? To remember God's Words from generation to generation. The Children of Israel have been traveling through the wilderness from Egypt to the Promised Land. A couple of verses earlier in Numbers 21 they were complaining again about the lack of food and water, so God taught them a lesson–He sent venomous snakes. The Israelites pleaded with Moses to pray to God to take the snakes away, and God answered their prayer with one of the most beautiful foreshadowings of Jesus in the Old Testament. 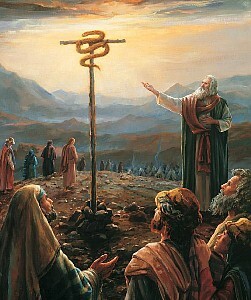 God told Moses to put a bronze snake on a pole. Anyone who had been bitten by a poisonous snake and looked at the bronke snake on the pole would live. We are the Children of Israel. We grumble and complain while we wander in the wilderness of this life--our lifelong march to our Promised Land, Heaven. We are constantly being bitten by the poisonous snake of sin and we are in sore need of a medicine that heals. Where does our help come from? Jesus is our bronze snake. My question? Why is the bronze serpent the foreshadowing of Christ? Why did God tell Moses to put a snake on the pole? A snake! The serpent in the Garden of Eden was the embodiment of the Devil. Why not put a lamb on the pole? But today's verse comes after this well-known Bible story. The Children of Israel were moving north and were again in need of water. And just like a loving father gives his kids what they need when they need it, God told Moses to gather the people together and He would give them water. So the Children of Israel sang about it. It seems strange that they didn't praise God in their song–they only praised the princes and nobles who dug the well. But isn't that the way we look at events in this life? We forget to thank God for His blessings, instead we praise (or curse) the water company who brings us the water. We are SO MUCH like the Children of Israel!